I love how the Ohio judicial center, home of the Supreme Court of Ohio, is letting off steam on this Sunday morning. Perhaps there was too much hot air in the building? The Leveque tower, the trademark of our city, is timeless. This building asks to be photographed. For more my world images, go here. We so often personify through animals, but I never thought about doing the same with buildings. Makes sense, especially considering its a government building. 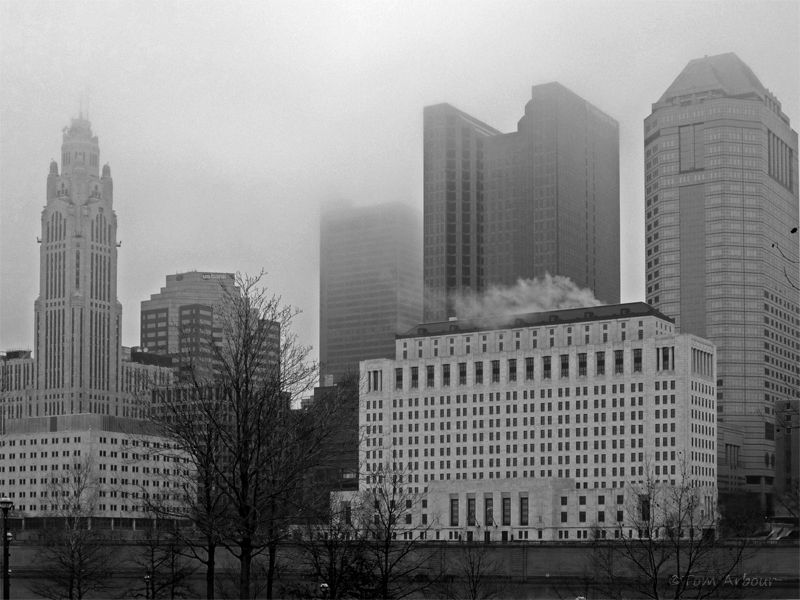 Great shot of the Columbus skyline, thanks for sharing. I love seeing the tall buildings in downtown Columbus. They are just beautiful. Thanks so much for sharing your part of the world with us. Tom: What a neat capture of the Columbus skyline. Chuckles over the hot air crack...very nice capture! Wonderful architecture but it looks cold there. Nicely done in B/W, with the mist it makes it very eye catching. On a sitting day one might have expected a sufeit of hot air, but on a Sunday? Arija- it takes a while for it all to escape. It might not ever be fully vented. A very interesting skyline. I'll be it gets hot and steamy in most courthouses. Thanks for sharing a piece of your world. I like this! The B&W really makes it a great shot. That is fantastic. Cityscapes really are best in monochrome to tease out those textures and atmosphere.